1873 Baha’u’llah revealed the Kitab-i-Aqdas, twenty years after He had received the intimation of His Revelation in the Siyah-Chal of Tihran. In one of His Tablets He indicated that even after its revelation the Aqdas was withheld by Him for sometime before it was sent to the friends in Iran (UHJ. 1992. The Kitab-i-Aqdas. p. 8-11. 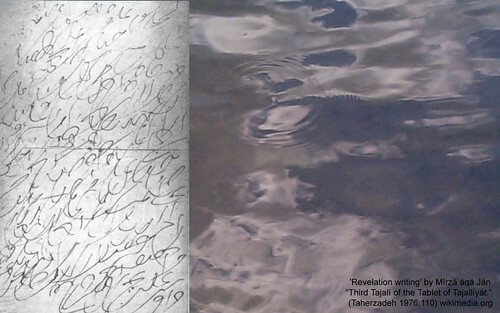 This is the detail ‘Revelation writing-calligraphy’ by Mírzá áqá Ján (original size 35×22 cm) selected by Adib Taherzadeh (1976:110) sheet of ‘revelation writing’ by Mírzá áqá Ján (original size 35×22 cm) of the third Tajalí of the Tablet of Tajallíyát. 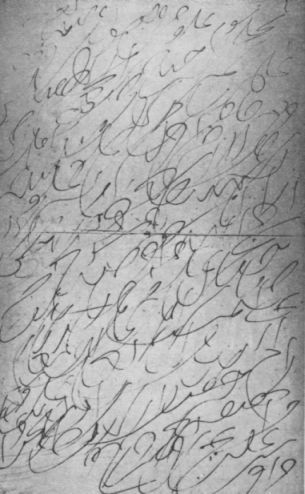 This is one of the Tablets of Bahá’u’lláh revealed after the Kitáb-i-Aqdas. It has been published in the Tablets of Baha’u’llah. pp. 51–52) . Late 1880s – early 1990s Baha’u’llah continued to reveal precepts and principles which lie at the core of His Faith recorded in unnumbered Tablets, which He continued to reveal until the last days of His earthly life.